Bbbbbrrrr! It’s another cold, chilly, windy and rainy day. What the heck’s going on around here? I’ve heard that we’re heading for an el nino summer??? One person told me that means hotter and sunnier, another said, lots more rain and cooler. I’ve just checked the long range forecast and it’s pretty much anyone’s guess how it’s all going to turn out! We’ll just have to wait and see…it’s kind of nice to know what to expect, but we can’t do anything about it anyway. 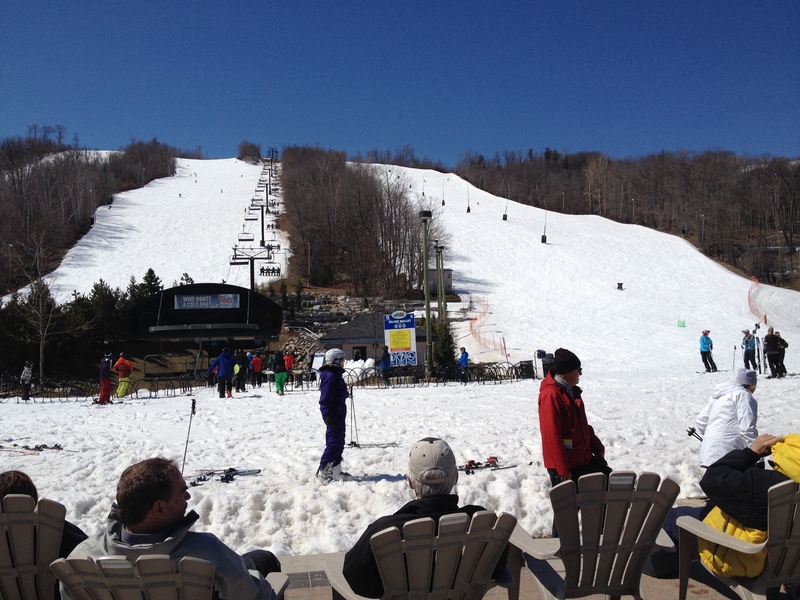 On the weekend, it was the last weekend of skiing at Blue Mountain in Collingwood. It has been a record breaking season for them. The only reason they are closing now, is so that they can get set up for the May long weekend. Apparently, it takes them 3 weeks to make the changeover from Winter to Summer. Anyway. We had a blast on the mountain in the last hooray of the winter we’ve all been complaining about. It was a weird phenomenon. All the snow on the 4 or 5 hills that remained open and if you didn’t look down or turn round, it looked like winter. But in the village, there were people walking, biking, roller blading and sitting enjoying the sunshine. I said to Donald, my Husband, “This is what it’s all about. Seizing the day. Live for the moment”. We could have been home pruning, raking, tidying the yard. But that is going to wait for us. It’s going to be there. But the snow…thank goodness, is going to be gone. After all this rain we are getting now. The hills should be clear by weekend!! As I’m cosied up inside, I’m listening to the wind howling, the rain beating down, the house feels as though it’s going to shake off the foundation…I’m going to end up on the Yellow Brick road. I can just feel it!!! I am thinking of my friends at John’s Gardens. They have been busily getting ready for Open Day. Which is probably about a month behind other years. I’m feeling guilty as I said I would go and help out one day this week…I thought Thursday would be a good bet. John will have lots of product to be set out by then and hopefully all is ready for Open Day on Friday May 2nd…and more hopefully, this rain will have stopped by then. I hope everyone’s got their rain gear on and are managing to stay safe. It sounds brutal. I Tried to take photos, but they don’t show what’s really happening out there. If you are out and about in the Uxbridge area this weekend. Pop into John’s Gardens. He’s having some Opening Specials…Rhododendron ‘Blitz’ 2 Gallon $15 and 25% off Primulas, Spring Annuals and bulbs. It’s a hidden treasure trove of garden delights! What’s coming up for Lou’s blooms? Well. Weather permitting. My friend Susan and I are going to have a market stall in our garden. We will be selling Cut Tulips and Daffodils, that Susan has grown herself and baskets and containers of plants and centre Pieces for Mother’s Day….more details on that next time. What beautiful arrangements you have. I can’t wait to get my Christmas planter, it always looks so different each year.